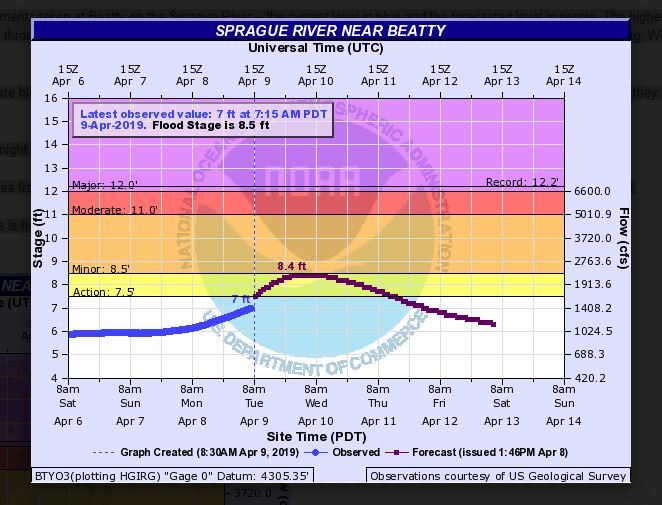 For your situational awareness, here are the measurements taken at Beatty on the Sprague River – the current level in blue and the forecasted level in purple. The highest levels in Beatty will happen late tonight through tomorrow morning. The town of Sprague River should see the highest levels tomorrow morning through tomorrow night, and Chiloquin should see the highest levels tomorrow night through Thursday morning. We are watching closely but do not anticipate any impacts. 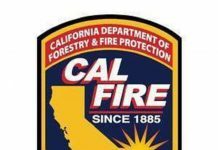 The highest level in 2017, when some structures were affected, was 9.6 feet. We have reports that most creeks around the county are high and flowing quickly, but no flooding issues have been confirmed. Remember to avoid water edges, as they may be eroded and unstable. We should expect high water on all lakes, rivers, and creeks for the next several days due to snow melt and run off. MyBasin.com combines print, audio and video into a single, online location – all for free. We add daily news and sports headlines, have updated weather forecasts and post the latest community announcements so you can plan your Basin-area recreation or attend a worthwhile cause.